Abingdon-on-Thames /ˌæbɪŋdən-/ AB-ing-dən-, known just as Abingdon between 1974 and 2012, is an historic market town and civil parish in the ceremonial county of Oxfordshire, England. 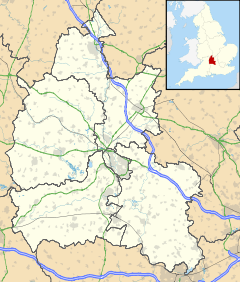 Historically the county town of Berkshire, since 1974 Abingdon has been administered by the Vale of White Horse district within Oxfordshire. The area was occupied from the early to middle Iron Age and the remains of a late Iron Age and Roman defensive enclosure lies below the town centre. Abingdon Abbey was founded around AD 676, giving its name to the emerging town. In the 13th and 14th centuries, Abingdon was an agricultural centre with an extensive trade in wool, alongside weaving and the manufacture of clothing. Charters for the holding of markets and fairs were granted by various monarchs, from Edward I to George II. The town survived the dissolution of the abbey in 1538, and by the 18th and 19th centuries, with the building of Abingdon Lock in 1790, and Wilts & Berks Canal in 1810, was a key link between major industrial centres such as Bristol, London, Birmingham and the Black Country. In 1856 the Abingdon Railway opened, linking the town with the Great Western Railway at Radley. The Wilts & Berks Canal was abandoned in 1906 but a voluntary trust is now working to restore and re-open it. Abingdon railway station was closed to passengers in September 1963. The line remained open for goods until 1984, including serving the MG car factory, which operated from 1929 to October 1980. Abingdon's brewery, Morland, whose most famous ale, Old Speckled Hen, was named after an early MG car, was taken over and closed down by Greene King Brewery in 1999, with production moving to Bury St Edmunds in Suffolk. The site of the brewery has been redeveloped into housing. The rock band Radiohead formed in 1985 when studying at Abingdon School. ^ "Traders claim revamp 'hit business'". 2013-04-15. Retrieved 2019-02-25. ^ "World of Bun Throwing". worldofbunthrowing.blogspot.com. Retrieved 2018-11-14.